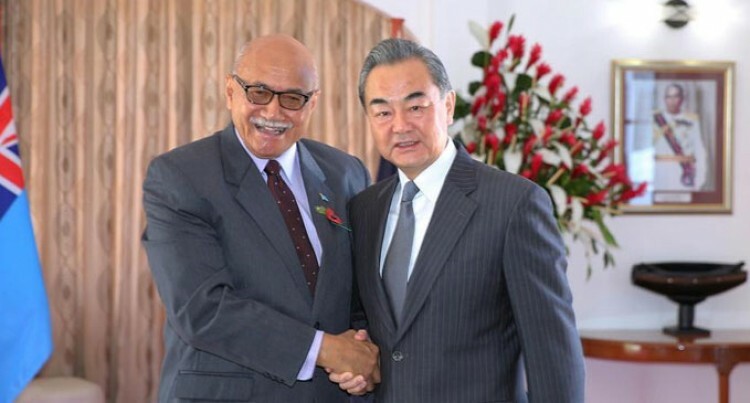 Fiji pledged yesterday to further strengthen all-around practical cooperation with China. This after Chinese State Councilor and Foreign Minister Wang Yi met separately with President Jioji Konrote and Prime Minister and Foreign Minister Voreqe Bainimarama. Xinhua reported that during his meeting with Fijian President Jioji Konrote, Mr Wang said China, as a developing country, will always stand by other developing countries as well as small and medium-sized countries. He said the China-Fiji relations have witnessed rapid development since they established strategic partnership featuring mutual respect and common development four years ago. Mr Wang reiterated that China’s support and assistance for Fiji have no political strings attached, is not intended for pursuing selfish interests, nor is it targeting any third party. He said China is willing to share experience of state governance with Fiji, strengthen mutually beneficial cooperation, assist in Fiji’s development and jointly safeguard the legitimate rights of developing countries, he added. While meeting with Fijian Prime Minister and Foreign Minister Voreqe Bainimarama, Mr Wang said China-Fiji friendship has withstood the test of changes in the international arena. Mr Wang is on an official visit to the Philippines, Papua New Guinea and Fiji.